Containment Box Color- Red, Yellow, Green. Cap. 60ltrs, 80ltrs, 110ltrs, 120ltrs, 200ltrs Etc. Best for Oil And Chemical Storage. The beautiful wooden wine case has exotic peacock on front panel, and comes with a handle to facilitate easy handling. ERS rod sources are calibrated by direct comparison of standardized solutions traceable to the National Institute of Standards and Technology (NIST), in an identical geometry, using a pressurized ion chamber with ±%5 accuracy.Source dimensions are 12.7mm x 127mm (0.5x 5) / 12.7mm x 74.9mm (0.5x 2.95). This is the most popular shipping container style. All flaps are the same depth and the two outer (lengthwise) flaps are one-half the container's width, so they meet in the center of the box when folded. Krishna Paper Products is one of the leading manufacturers of all type of Paper Corrugated Boxes and its accessories in India since last three & a half decades. We here at Krishna Paper Products also design & develop Paper Corrugated Packages according to our client’s requirement for domestic as well as for the market overseas. A variation of the RSC, the HSC has one less set of flaps. HSCs can be printed in up to three colors. Stackability and durability are the hallmark of this style. All flaps are the width of the box, thus creating a nearly complete overlap when closed. This overlap creates a stable stacking surface that is less prone to tipping when stacked higher. Overlapping flaps also provide added cushioning. 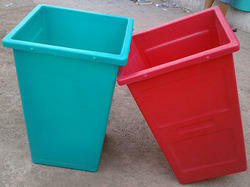 We offer wide range of Supreme Big Container.